The biggest aviation event held on August Bank Holiday is the Dunsfold Wings and Wheels show held at the secretive Surrey airfield. As the name suggests it is not just as airshow, but also a celebration of historic motorsport, supercars and military vehicles, many of which are paraded or demonstrated on Dunsfold’s runway. The aviation side of the event is very different from some other shows and always reflects the history of Dunsfold Aerodrome and Brooklands in its displays. Dark clouds hung over the Air Display world for Dunsfold. The event was the first major airfield based event to take place in the wake of the Shoreham Airshow tragedy which happened a week before. The events of Shoreham had placed a lot of focus and scrutiny on airshow safety and Dunsfold was one of the first events to come under the new risk assessments and regulation by the Civil Aviation Authority. The event also attracted a lot more national media than usual too as airshows became a subject of national interest. In many ways however, Dunsfold was the event the UK Air Display Industry needed at such a time. It is a highly regarded event by those who attend who enjoy a relaxing, fun atmosphere with some wonderful cars and truly great flying. The essential key to that atmosphere during the flying is the commentary team of Melvyn Hiscock and Brendan O’Brien. Between them they have been instrumental in making Wings and Wheels the success it is bringing the displays to life with enthusiasm, facts and great humour throughout. As is traditional for Dunsfold, each afternoon was split up into sections of motoring and aviation. Sunday saw a bonus aviation section with Brooklands Museum performing a fast taxy of their latest aquistition, a former Royal Air Force Vickers VC10 K3. This VC10, ZA150, arrived at Dunsfold Park more than two years ago but this was its first public taxy run since its arrival. The weather was not the kindest to Dunsfold. Saturday saw a nice morning degenerate into a bright, but slightly damp afternoon while Sunday stayed dry, but with a stubborn layer of low clouds that never really shifted and was up and down like a yo-yo. However, a full programme of flying was presented on both days much to the credit of the pilots and those overseeing the display. The VC10 was not the only piece of Brooklands and Dunsfold related aviation history on display. Dunsfold’s wartime story was again well represented in the flying. Opening the flying display on both days was Peter Teichman in his Curtiss P-40M Kittyhawk. Preceding Peter’s display, the commentating team introduced a moving 1 minutes silence to those who had lost their lives the week before. As Peter pulled up, it really was one of those lump-in-the-throat moments for many on the airfield. The Kittyhawk is a very apt warbird for Dunsfold. The Royal Canadian Air Force was present at the airfield with three squadrons with operated the type when in opened in 1944. Also, the famous Dunsfold test pilot Neville Duke flew RAF P-40 Tomahawks during the North African campaign. Another superb warbird display came from the Old Flying Machine Company with Brian Smith and Steve Jones flying Supermarine Spitfire IX MH434 and North American P-51D Mustang Ferocious Frankie. The pair flew a brilliant and evocative formation and solo aerobatic routine despite flying in some difficult weather. The Dunsfold theme was continued with the North American TB-25N Mitchell from the Royal Netherlands Air Force Historic Flight. Three RAF squadrons of B-25s were based at Dunsfold including 320 sqn which was a unit of personnel from the Netherlands. Another ‘heavy’ participant was Aces High Douglas C-47A Skytrain which is a current Dunsfold resident. Despite post-Shoreham restrictions on classic jets, there were two at Dunsfold which were both stars of the show in their own right. Appearing on both days was the Norwegian Air Force Historical Squadron Mikoyan MiG-15UTI. This exciting addition to the European airshow circuit has been appearing at a number of seaside airshows throughout the summer though this was its only appearance at an airfield based event. It performed some lovely passes under the clouds for the appreciative crowds. Avro Vulcan B2 XH558 made its final public Dunsfold appearance on the Saturday of the show. Sadly weather between Dunsfold and the aircraft’s base at Doncaster prevented an appearance on the Sunday. Supported by Eddie Forrester of Aerobytes who lives locally to Dunsfold, the Vulcan has been a key performer at Wings and Wheels over the past few years. While it may be sad that 2015 saw the final appearance of the Vulcan at Dunsfold, it was a great send off. Aerobytes are also a key sponsor of The Blades Aerobatic Team which headed up an impressive array of civilian displays. GliderFX also returned to Dunsfold with Guy Westgate flying his MDM-1 Fox glider supported by Ian Gallcher in the Piper PA-25 Pawnee. Guy also flew a solo aerobatic routine in Aerobility’s Yakovlev Yak-52. More dramatic aerobatics came from Rich Goodwin in his Pitts S-2S Special. Rich started his display performing alongside a Porsche 911 on the main runway with a series of Top Gear style races! More traditional barnstorming came from the Turbulent Display Team with their mix of formation flying, limbo flying, flour bombing and balloon bursting. Barnstorming is one of Brendan O’Brien’s passions in the display world and he along with team commentator Sam Williams gave a highly entertaining run-down of the team antics. The Barnstorming theme was continued on the Sunday with the Breitling Wingwalkers who managed to squeeze in an appearance at Dunsfold amongst a very busy summer schedule of European airshows. The Tigers Parachute Display Team is almost part of the home team at Dunsfold. The Princess of Wales Royal Regiment draws its personnel from the South East area have long been a feature of Wings and Wheels. While the Gatwick airspace somewhat limits their shows, they always put on a great spectacle. On Sunday, they caused Melvyn and Brendan some confusion ahead of their display as their team commentator had failed to turn up! As the Headcorn based BN-2 Islander arrived overhead there was still no sign of a commentator, but almost immediately one of the Tigers jumped out landing right infront of the commentary box to save the day and commentator on the rest of their display! The team had got stuck in traffic and diverted to another airfield where the Islander picked them up so they could make their display slot. The Royal Air Force had an impressive showing at Dunsfold. On the ground, the BAE Systems Hawk T1 of 208[R] Squadron carrying special centenary markings was on static display alongside a Airbus Helicopters Puma HC2 from RAF Benson. In the air, Dunsfold enjoyed almost all of the RAF 2015 display teams. Saturday saw the Red Arrows headline the show bringing their venerable BAE Systems Hawk T1 aircraft back to their spiritual home. The Hawk story was brought right up to date with the 4[R] Squadron BAE Systems Hawk T2 Role Demonstration team from RAF Valley. These new aircraft are much more representative of modern front line aircraft with glass cockpits and modern avionics. They also make full use of synthetic training aids provide advanced jet flying and weapons training. The Role Demo team’s routine highlights many of the training scenarios 4[R] Squadron provide for their students with the aid of supporting pyrotechnics and has been a highly engaging addition to the display circuit this year. Completing the training theme was a look at RAF elementary training with the Grob Tutor T1 flown by Flt Lt Andy Preece partnered with the Scottish Aviation Bulldog T1 flown by Rod Dean. Both took off together before performing their own solo routines. Sadly, there will be no Tutor solo display in 2016 and while it is not the loudest aircraft not the fastest, it was be greatly missed from the circuit. In Andy’s hands, it has always been one of the best flown displays and it one of the few modern military displays that can operate from the smallest airfields boosting the RAF’s presence at many shows. As ever the RAF Chinook HC4 display team gave a cracking account of the RAF’s main battlefield support helicopter. Sunday saw an all-too-rare appearance by 18 Squadron’s specially marked aircraft which celebrates the unit’s centenary. The 75th Anniversary of the Battle of Britain was celebrated by the presence of the RAF Typhoon Display Team and the Battle of Britain Memorial Flight. Both the solo Typhoon FGR4 display flown by Flt Lt Jonny Dowen and the standard fighter pair of Spitfire II and Hurricane IIc were presented by both team. However, perhaps the outstanding highlight of the RAF contribution to Wings and Wheels was the Synchro75 formation of Eurofighter Typhoon FGR4 and Supermarine Spitfire II. It is an epic piece of aerial theatre with the two aircraft perfectly matched despite the 75 years between them. The display drew huge applause from the crowd and we hope that such a pairing will be seen again in the near future as it is such a great spectacle at all the airshows it has attended. 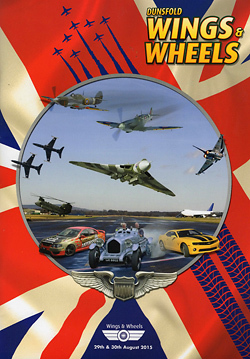 This was a classic Wings and Wheels. Jamie McAllister, Event Director, commented: “We had it all at Wings & Wheels this year, tears, laughter, sunshine and rain but without doubt it was the best show we have put on. Each year we work hard to improve everything on the ground and in the air and there were so many highlights it’s difficult to single one thing out from the aviation and motoring displays. There are countless people to thank for ensuring Wings & Wheels is such a success, not least our visitors who support us each year without fail. Thank you and see you in 2016!” As we said in the introduction, this was the airshow the industry needed and it more than delivered showing off the very best of UK airshows. We look forward very much to Wings and Wheels 2016!